Thanks so much for the wonderful review of my book. 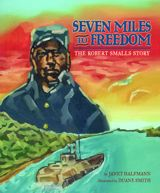 I am so excited to announce that I have been invited to read Seven Miles to Freedom: The Robert Smalls Story at the African American Civil War Museum in Washington, DC, at 11 am on Friday, July 29, 2011! I hope to see some of you there.